Here's the reaction of Judge Rowena Apao Adlawan of the RTC Branch 13 on Risa Hontiveros' ignorant comment about the government's action on Maute's invasion of Marawi City. 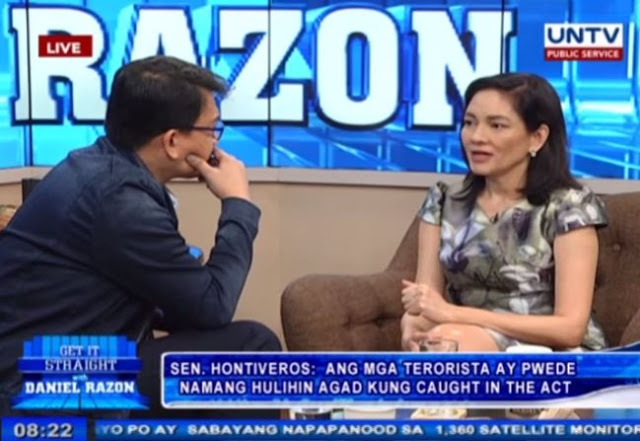 I watched the interview of Senator Hontiveros on the matter of the declaration of Martial Law. For her, there is no factual basis for it. I cannot help but be dismayed and disgusted because the senator said that the Constitution has made a definition of what rebellion or invasion is. For the record, the Constitution does not define the crime of Rebellion. You can find its definition in the Revised Penal Code (RPC). Art. 134 of the RPC states: The crime of rebellion or insurrection is committed by rising publicly and taking arms against the government for the purpose of removing from allegiance to said government or its laws, the territory of the Republic of the Philippines or any part thereof, of any body of land, naval or other armed forces, depriving the Chief Executive (President) or the Legislature, wholly or partially, of their powers or prerogatives". She averred that what happened in Marawi did not constitute rebellion because Marawi residents did not rebel against the national government. From the reports on TV and the newspaper, the Maute group raised their ISIS Flag in the city and took Marawi City from the control of the National Government, by rising publicly using high powered firearms for the purpose of removing allegiance of the Philippine government any part of its territory. While I respect on her right to express her opinion on the matter however I got dismayed for clearly, she has not been in touched with the realities and she also has no grasp on the law despite her being a lawmaker. And definitely I hate the words that I would hear later telling me: "pasensya na hindi kasi sya lawyer". You do not have to be lawyer for you to understand the reality vis-a-viz the law. Judge Adlawan, someone who is considered as an expert on the laws of our land, basically burned Hontiveros. Merese!